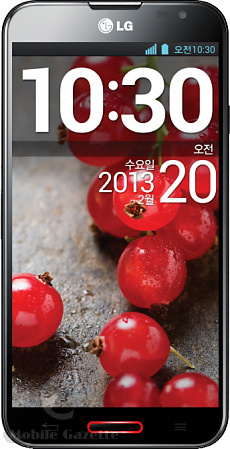 The LG Optimus G Pro is LG's first full-HD smartphone, due to be released in Korea very soon with Japan and North America following during Q2 2013. A real beast of a device, the LG Optimus G Pro has a 5.5" 1080 x 1920 pixel IPS display, a 1.7GHz quad-core Qualcomm Snapdragon 600 processor, 2GB of RAM with 32GB of onboard flash plus a microSD slot, a 13 megapixel primary camera and a 2.1 megapixel video calling camera plus a very large 3140 mAh battery which is one of the largest we have seen. The 400 ppi display on the Optimus G Pro is somewhat sharper than the 326 ppi "retina display" in the current iPhone, and significantly better than the 267 ppi Samsung Galaxy Note II, which is pretty awesome. The bezel to the left and right of the screen is almost impossibly thin at just 3mm across, and the Optimus G Pro measures 150 x 76 x 9.4mm and weighs 172 grams.. that's 6% smaller and lighter than the Galaxy Note II, which is a pretty impressive feat. Usefully, the Optimus G Pro can output to an HDMI device, so you can play back full HD video on a compatible TV. The Optimus G Pro also has wireless charging, NFC and all the usual features that you would expect to find in an Android 4.1 smartphone, including WiFi, GPS, Bluetooth and USB connectivity. The camera has an LED flash, an advanced 360 degree panoramic function, full HD capture capabilities on both the front and back and a tracking focus feature that allows the focus to be locked to a moving object (for example, a person or animal). LG say that the Optimus G Pro will support HSPA+, EVDO and LTE (4G) data, although it is not clear if this is all in one handset or if there will be a separate GSM/HSPA+ and CDMA/EVDO version. The operating system is Android 4.1.2 with LG's own UX interface on top, featuring advanced task management and enhanced personal information management tools to differentiate it a little from stock Android phones. LG say that the Optimus G Pro will cost 968,000 won in South Korea, the equivalent of about €670 or $900, but street prices might well be cheaper. It's in roughly the same high-end price bracket as the Galaxy Note II and iPhone 5 though, but it has a much higher specification than either of those two devices. 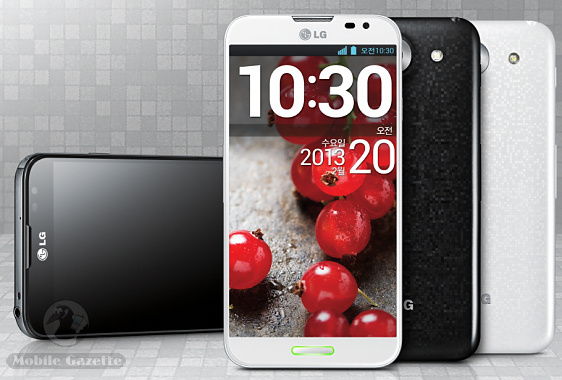 We don't know if the LG Optimus G Pro will be available in any other regions other than Korea, Japan and North America, but we may well get more information towards the end of the month. This does look like an extremely competitive and desirable device, and we very much hope that LG will choose to release the Optimus G Pro in Europe as well as those other markets.